Non-structural 5A (NS5A) protein plays a crucial role in the replication of hepatitis C virus (HCV) and during the past decade has attracted increasing attention as a promising biological target for the treatment of viral infections and related disorders. Small-molecule NS5A inhibitors have shown significant antiviral activity in vitro and in vivo. Several lead molecules are reasonably regarded as novel highly potent drug candidates with favorable ADME features and tolerable side effects. The first-in-class daclatasvir has recently been launched into the market and 14 novel molecules are currently under evaluation in clinical trials. 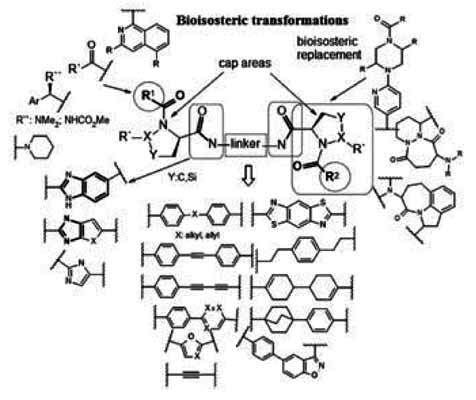 From this perspective, we provide an overview of the available chemical space of small-molecule NS5A inhibitors and their PK properties, mainly focusing on the diversity in structure and scaffold representation. NS5A, Inhibitors, Antiviral, HCV, ADME, Pharmacokinetics.